Vision in the Classroom - Camas WA | Dr. Scott Lewis, O.D. Most learning is achieved through the use of a child’s eyes. Despite the overt link between vision and learning, a lot of parents don’t realize how profoundly vision problems affect education, and as a result, don’t get their child’s eyes examined regularly. 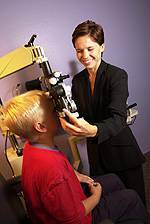 As your child’s vision may change frequently, regular eye exams are necessary for success at school. Kids have the amazing ability to work with a vision problem. It is especially important to keep an eye out for the signs and symptoms of vision problems as your child progresses in school. Inadequate vision and increasing visual demands like smaller print in textbooks or additional homework can noticeably affect their academic performance. New technology brought into the classroom, such as the use of interactive whiteboards, can even provoke less obvious vision problems. Without adequate vision, students may suffer not just in the classroom, but also mentally, physically and emotionally. If your child has already been fitted for glasses, now is a good opportunity to consider buying a new pair of frames. Even when a child can see well with his or her old glasses, the fit might be wrong or perhaps the lenses no longer align with the child’s eyes due to normal growth. If you want the child to wear his glasses, he better feel good about them! So be sure to make an appointment to see us when you’re gearing up for the new academic year. We’ll help all the children we treat start the year afresh with vision that’s in excellent condition.